Subscription fees: £6.49 per month or £64 per year for 14 days or £9.99 per month or £99 per year for 60 days of cloud backup of video. Additional plans for 24/7 video monitoring also available. Netgear’s Arlo isn’t just a single camera, it’s a rapidly-growing range that shares the same software platform – at the time of writing you’ve got six different cameras to pick from. You can also choose between packs of one, two or more units, and accessories such as a Wi-Fi expander hub for outdoor use. 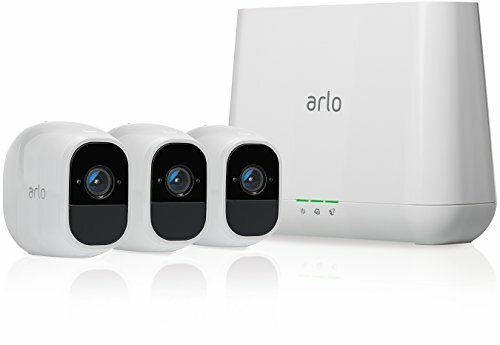 We’ve named the Arlo Pro 2 as our top pick, with its wire-free operation, two-way audio 1080p HD video, weather resistance, built-in security siren, Amazon Alexa support and the option to store footage on a USB drive. Cheaper models are available if you don’t need such sharp video or a different set of features. The new Arlo Go, for instance, works with cellular networks if you need a camera out of range of your home Wi-Fi. 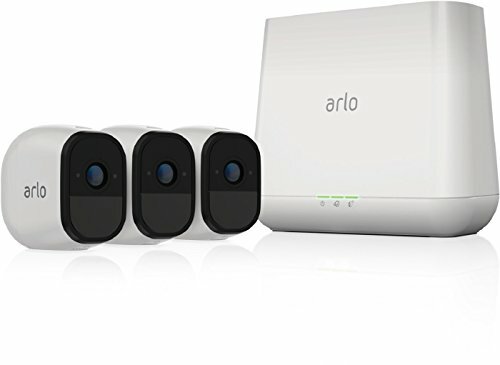 As with most security cameras, you can tap into your video feeds from anywhere using your phone, and get motion alerts – but where the Arlo range stands out is with the wireless, battery-charged operation and waterproofing. For free, you get seven days or up to 1GB of cloud storage for up to five cameras, which compares very well with rivals such as Nest. These recordings are only triggered when motion is detected, but it should be enough for most users – how many meaningless shots of nothing happening in your back garden do you need? Subscription fees: £4 per month or £40 per year for 5 days of cloud backup for video and various advanced features. £8 per month or £80 per year for 10 days. £24 per month or £240 per year for 30 days. The Nest Cam IQ is one of the most intelligent Wi-Fi cameras on the market, bringing facial recognition, a 4K image sensor, and person tracking to the party. See below for the indoor version, but this exterior version comes with IP65 weatherproofing: it’ll stay recording whatever the British weather throws at it, and can operate in temperatures from -40°C to 45°C. Picture quality is excellent both during the day and night, and the motion tracking (which zooms in and follows motion) and facial recognition (which only alerts you to unknown faces) are incredibly useful features which actually work. It’s a top-notch package but it’s expensive, and to get the most out of it (like cloud storage archives or motion zones) you really need to sign up for a subscription too. You can just about get by with the live motion alerts and livestreaming (no subscription required) if you’re on a budget. The previous, cheaper version of the outdoor Nest cam is still on sale too if you want to save some money – it does have a cable attached though, rather than working wirelessly, which means it’s a bit easier to sabotage for potential intruders. Definitely one of the best security cameras in 2019. Subscription fees: £2.99 per camera per month for 14 days of cloud backup of video. £7.99 per month or £79.99 per year for 31 days of footage and more advanced features. The Logi Circle 2 is the most fun of our best security cameras 2019 list: it’s a bit like the home monitoring equivalent of a Fitbit. For example, it preps “day brief” videos that show a sped-up version of the day’s action of the day (so you don’t have to sift through reams of footage of the slightest motion). That makes it more suitable for keeping an eye on the dog while at work, rather than scanning for burglars. There’s two-way talking, fast responses to remote commands, speedy zooming, and an adjustable field of view. The app is nice and slick, complimenting the camera’s own neat design, and you can control the Circle via Amazon Alexa, Apple HomeKit or one of Logitech’s Pop smart home buttons. There are some negatives: you only get 24 hours of cloud storage for free for instance. For longer-term access, you have to pay: £2.99 a month snags you 14-day Cloud access, or £7.99 a month for 31 days. You need to subscribe to the top tier to set you custom motion zones and detect people in front of the camera. Buy a rechargeable battery base as well and you can put the weatherproof camera anywhere in Wi-Fi range (it lasts up to three months between charges). There’s also a fully wireless incarnation, but this is a different shape to the wired version and has a different range of accessories. It might lack some security features, but as a smart home camera for watching pets or your gran, the wired version of Circle 2 is hard to beat as one of the best security cameras of 2019. Subscription fees: £4.99 per month for 30 days of cloud backup for video and SMS alerts. We wouldn’t recommend Hive View as a ‘proper’ security camera per se, but if you want an attractive camera for monitoring pets and relatives that can also alert you to felons, it works really well. We’re big fans of its striking, stylish looks, and the monthly subscription is unusually cheap (you get one day of video stored for free) – it’s definitely worth a place on our best security cameras for 2019 roundup. Admittedly the Hive View is rather limited features-wise at present, but Hive products have a tendency to get better with age, and we’re reasonably confident it’ll add Alexa support (as it has for its other smart home devices) soon. A recent update added two-way chat so you can sooth the pets or ward off burglars. The basic mount and wall mount make it easy to setup at an angle to your liking – the 130-degree field of vision helps – and there’s the option to remove it from the mount and use it wirelessly, albeit only for an hour. That could be useful for baby bedtime duties, although we struggle to think of many other uses. You can download and share videos, should you need to, motion detection works as advertised, and image quality is decent – with a choice of 720p or 1080p maximum resolution depending on the available signal strength. We’ve split out the Nest Cam IQs separately in our best security cameras 2019 list because the indoor and outdoor variants really are distinct devices, and which one you need will depend on where you’re putting them. What stands out about these security cameras is the intelligence behind them and the quality of the apps Nest (now owned by Google) has put together. Video crispness is also great, and this camera can shoot in (compressed) 4K. That means you get a clearer look at everything that’s happening, and zooming is actually something that’s useful. There’s a neat auto-zoom mode here too, making it an easy choice for our best security camera roundup. You do need a subscription for a lot of features, like cloud archives and the ability to distinguish between strangers and family members (the camera can identify a person on the free plan, but not who the person is) – so make sure you budget accordingly. The older Nest Cam, with the previous design, is still on sale if you need something a little cheaper. You still get 1080p HD streaming, and access to the very intuitive app – just not as many of the bells and whistles.